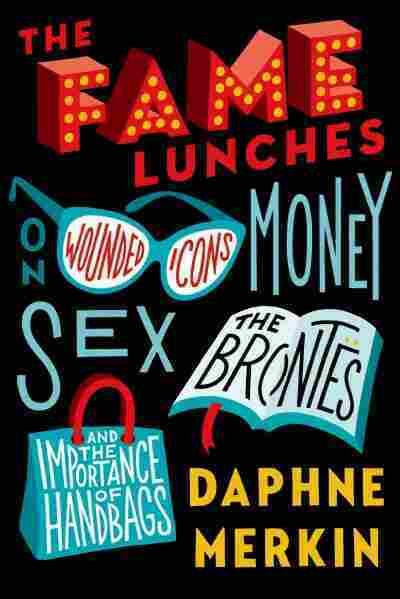 Book Review: 'The Fame Lunches' By Daphne Merkin | Daphne Merkin's new essay collection straddles the high/low cultural divide with aplomb. Reviewer Heller McAlpin says Lunches is unfailingly intelligent, but should be enjoyed in small bites. "The truth is I've been something of a bifurcated, high/low girl from the very start," Daphne Merkin declares in The Fame Lunches, her first collection of essays since Dreaming of Hitler in 1997. This new anthology gathers 45 wide-ranging essays that straddle the high/low cultural faultline with aplomb, weighing in on subjects as diverse as W.G. Sebald, Jean Rhys, Margaret Drabble, Courtney Love, lip gloss, kabbalah and handbags as "the top fashion signifier." Merkin made her name as a trenchant book and cultural critic, but — as she herself acknowledges — she's far more widely known for her "bold, almost reckless self-disclosure — whether the topic happens to be the terrors of pregnancy, the erotics of spanking (a two-decade-old essay that will undoubtedly dog me for the rest of my days), or my habitation on various psychiatric wards." The Fame Lunches contains no such startling confidences. Its emphasis is on Merkin's cultural writings, dating back to 1980. Eschewing articles about her Botox treatments, lifelong psychotherapy or the allure of Prince Charles and Camilla, the collection seems designed to refresh Merkin's reputation as an astute literary critic. But although unfailingly intelligent, it is better enjoyed piecemeal than cover to cover. Plowing immoderately through these 45 essays, one after another, is a binge that can lead to opinion overload and celebrity glut. And as with any anthology, some subjects are bound to strike a reader's fancy more than others. Despite Merkin's best efforts, I just couldn't muster much interest in Sandra Dee or Courtney Love, for example. Rest assured that readers looking for more personal material won't be entirely disappointed: In a 2013 essay reprinted from Elle, "In My Head I'm Always Thin," Merkin discusses her dismay about having "sized myself out of Barneys and most of the clothes I coveted." "Our Money, Ourselves," first published in The New Yorker in 1999, grapples with the confusing mixed messages she received about money as a child; she and her five siblings grew up in a well-staffed Park Avenue duplex, yet they fought for second helpings. Merkin, whose financier father endowed hospitals, yeshivas and Merkin Concert Hall in Manhattan, writes incisively: "At some point I took to muttering darkly to my mother that charity began at home, but she would always fix me with a contemptuous look and ask, 'And what exactly is it that you lack?' She managed to make me feel ungrateful and grabby at once." Merkin's celebrity profiles and reviews of biographies are revealing in a less direct way. She is repeatedly drawn to what she calls "wounded icons" and "fragile sorts," people who share her sense of "emotional deprivation" and of "not having been loved" as a child. This group includes Marilyn Monroe, Michael Jackson, Princess Diana, Mike Tyson, Virginia Woolf and Nuala O'Faolain. Her choice of subjects also repeatedly reveals the high value she places on openness to change, "a certain porousness — an unfiltered receptivity to the comings and goings of the zeitgeist." In her estimation, Henry Roth had it, retaining "a certain plasticity of temperament through his life, a receptivity to the imprinting of new experience" that enabled him to finally follow his 1934 masterpiece, Call It Sleep, with his six-volume Mercy of a Rude Stream six decades later. The designer Geoffrey Beene, who, with his "layered and self-reflective aesthetic ... made it okay for me to take fashion seriously," also had it. "Beene remained open to new ideas throughout his career, reinventing the connection between clothes and lifestyle many times over," Merkin writes. "A Tip of the Hat," Merkin's judicious 2009 tribute to John Updike shortly after his death, exemplifies her literary chops. She highlights his remarkable range and attention to detail, his "honed, even finicky words," but also explains how, after 1990, "His vaunted cosmopolitanism began to feel dated." She adds, with a dapper flourish: "He began to seem like a man who always wore a hat to work." Bingo. The essays included in The Fame Lunches obviously have been carefully selected for their enduring fascination. Since Merkin wrote about them, Sylvia Plath, Virginia Woolf and F. Scott and Zelda Fitzgerald continue to generate unflagging interest, Alice Munro has won the Nobel Prize, Michael Jackson has died, and Cate Blanchett has gone on to even greater acclaim for her depiction of a character based on that most wounded of icons, Blanche DuBois, in Woody Allen's Blue Jasmine. One wishes that Merkin had provided postscripts, not just for the late-blooming Irish writer Nuala O'Faolain — who touchingly left Merkin "a small gift of money" when she died of cancer at 68 in 2008 — but for some of her other subjects. On the other hand, perhaps it's best to leave readers wanting more.